CHICAGO – When Peyton Manning steps onto the Soldier Field grass Thursday night to play his first game in 19 months, one of the greatest quarterbacks in NFL history will be ready for some football, in all its violent splendor. "I'm excited to get going," Denver Broncos executive vice president of football operations John Elway said Wednesday evening, shortly after arriving at the team's hotel near the Chicago Bears' home field. "Whether Peyton gets hit or not, it's exciting to get him on the football field. Instead of talking about what might happen, we can talk about that. "As a quarterback, you always enjoy taking that first [hit]." It's quite possible that the man staring across the line of scrimmage from charged-up behemoths such as All-Pro defensive end Julius Peppers, and is coming off neck-fusion surgery that sidelined him for the last of his 14 seasons with the Indianapolis Colts, does not share his new boss's enthusiasm for contact. After all, while Elway retired as the most sacked player in NFL history – "That's one of my records," jokes the Hall of Famer, whose takedown total (516) actually was surpassed by Brett Favre – Manning's career has been characterized by a zero-tolerance policy for collapsing pockets. His mastery of the Colts' offense and ultra-quick release helped keep his uniform cleaner than those of most of his peers, and there's no reason to think that approach won't extend into tonight's preseason debut with his new team. How Manning might hold up when hit is one of the many intriguing questions that could begin to reveal themselves to an expectant audience Thursday night during Manning's limited stint under center. Elway, the driving force behind Manning's decision to sign with the Broncos last March after being discarded by the rebuilding Colts, expects the 36-year-old quarterback to take about 10 to 12 snaps against the Bears, depending upon game conditions. "If he gets out there and has a good series, that would probably be it," Elway says. "I would like to get some rhythm going – that's the main thing. However long it takes to get a couple of first downs and, hopefully, some points." Elway insists he isn't nervous about this game, partly because Manning has been so impressive in the practices. While there are lingering questions about his ability to throw deep, the zip on his short and intermediate passes has been impressive. 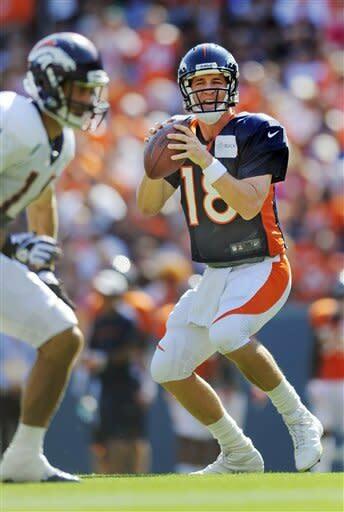 Last March, when Elway and other Broncos officials snuck down to Duke to watch Manning conduct a private workout while courting the four-time MVP, they saw a quarterback with limited range and velocity, the product of nerve damage that he hoped would be reversible. "He's come a long way since we saw him at Duke," Elway says. "We had to rely on our doctors – they all thought the nerve would come back, that it was just a matter of time. 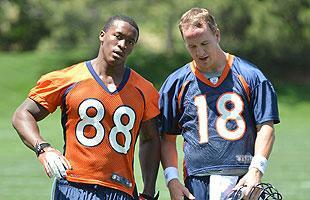 Plus, we knew how hard a guy with Peyton's mindset would work to get back. I see him at practice every day, and he's really throwing the ball well." While Elway specifically declined to comment on Manning's polarizing predecessor, current New York Jets backup Tim Tebow, it's clear from his comments that he believes the quarterback transition has been transformative. Whereas Tebow routinely delivered errant balls in practice, literally putting some of them in the trees bordering the fenced-off fields at the team's training facility, Manning is fitting most of his throws into tight windows. For young receivers such as Demaryius Thomas and Eric Decker, that's not an insignificant change. "They're gonna be a lot more refined, and they've got hope," Elway says. "Because they know if they run the right routes at the right depth, the ball's going to be there waiting for them when it's supposed to. They got really sloppy at the end of last year, because the ball never came out on time." That attitude adjustment, Elway believes, carries over to the entire team. "It brings hope," he says of Manning's presence. "As a football player, you want to have a chance to compete for a world championship, first and foremost. That's what Peyton Manning brings, because he has done it, because of his career so far, and because of his ability. He brings great energy, just because of that hope." This is not to say that there's a breezy atmosphere at Broncos camp. Manning's prickly personality hasn't mellowed with age, whether he's exhorting teammates to fulfill their assignments or lobbying the front office to sign veterans, as he did before the recent acquisitions of safety Jim Leonhard and linebacker Keith Brooking. "You know how he is," Elway says of Manning. "He's such a perfectionist. He wants to feel perfect. He wants everybody to be perfect. And if it isn't, he's working to get there." Elway plans to have a pregame conversation with Manning, during which he'll likely remind him not to over-think his long-awaited return to live action. "The game hasn't changed and neither has he," Elway says. And if Elway is stressed out about the possibility of watching a man to whom he's paying $18 million this season absorb a hard shot from the Bears' defense, the legendary passer isn't revealing it, instead framing all those blasts from the past in positive terms. "As a quarterback, you like that first preseason game, because all the other guys have been hit, so really you're the only one who hasn't," Elway says. "You don't want to say, 'I hope I get my block knocked off,' but there's something about getting through that first one that got you going. "Peyton hasn't been hit in practice; I think he got kicked in the thigh once. So, we'll see what happens. But really, Peyton hasn't been hit in like 10 years, so what are we worrying about?"